Invited back to design a room set in ‘Colour Blocking’, we designed a combined media-related, library room. Conjuring the serenity of colonial style with balmy rainforest and inspired by an exotic blend of nature’s favourite colour combinations; green and then white, is fired by sun yellow and found by a palette of calming blues. 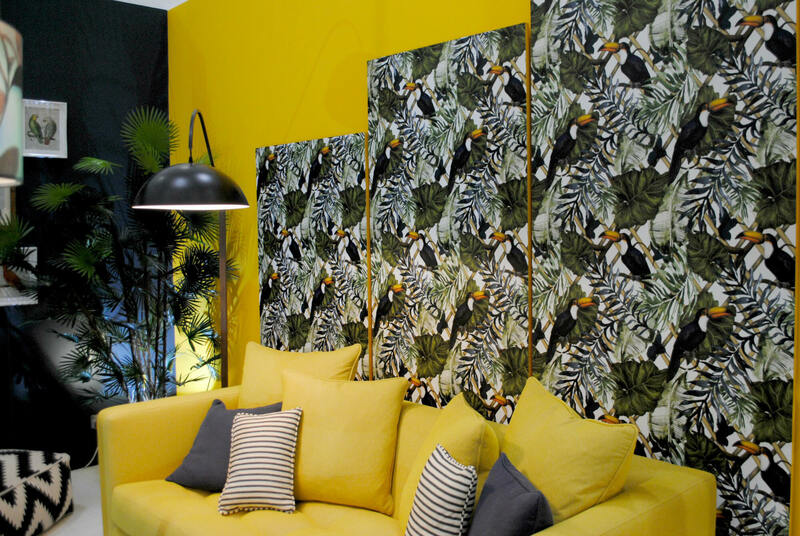 A vibrant display of rain forest inspired wallpaper, designed by Charlotte Jade, illustrator, provides a backdrop for an eye- popping yellow sofa supplied by Sofa and Chair company. The effect is enchanting and larger than life. Charlotte specialises in bespoke, hand-drawn patterns. Her work played across a variety of mediums such as interiors and fashion. Apart from the fact it offers the option to remove and replace with a new design in the future, I do feel the statement wall now duly overplayed. The panel system gives the opportunity for them to be mobile. Application of white rubber flooring - from Harvey Maria, and natural wood in legs in furniture bring all the elements together for a fresh, light and exciting room setting. There is a ‘screening off’ area central by way of media cabinet in yellow and white, provided by Paolo Marchetti, London, offering a screen to separate reading and lounging areas. Other accessories from Habitat and paint colours from Sanderson. As in as previous exhibitions, it was a great opportunity be part of an exhibition environment, immersed in the hub of cutting-edge design and rubbing shoulders with the most well-known designers such as George Clark, Jo Hamilton and the frontman of Channel 4’s Grand Designs, Kevin McCloud, one cannot fail to be inspired. Circulating the show as exhibitors there are undoubtedly endless products on offer and design inspiration to be divulged, and in essence, dictate what the show is all about.